What's on at Miramar Library? Nau mai haere mai, welcome. On this page you'll find information about what's happening at Miramar Library - news, events, photos, staff picks and more! CRAFTerschool at Miramar Library is a free art and craft session aimed at school-aged children. Sessions run from 3.30pm - 4.30pm every Wednesday during school terms - come along and get stuck into activities such as drawing, beading, origami, mask making, and more! Nau mai, haere mai ki Motukairangi! Come and join us at Miramar Library on the 4th Tuesday of each month at the new time of 2pm. Open to anyone, these free 30 min sessions feature stories, rhymes and waiata in te reo Māori, and are perfect for 2-6 year olds and their caregivers. Early childhood centres are welcome. You don't need to be a fluent Māori speaker for you and your tamariki to enjoy the sessions. Welly WiFi is available at Miramar Library. Just bring in your wireless-compatible device and log on for free. Come along and be entertained by our wonderfully gifted storytellers! 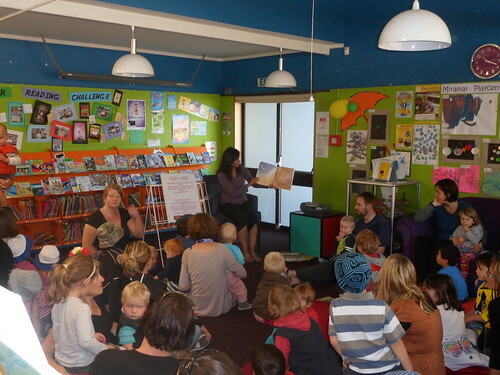 Preschool Storytime sessions are held at Miramar Library every Thursday at 10.15am. Enjoy listening to new stories as well as old favourites. Grab a cushion and make yourself comfortable! Our hugely popular Baby Rock & Rhyme programme is held every Tuesday morning (except during the Christmas Holidays). A free, interactive, fun-filled session of songs, rhymes and fingerplays for babies 0-2 years and their caregivers. Each session starts at 10:15am and runs for approximately 20 minutes. Arrive early to grab the best spots. Miramar Library plays host to a vibrant book club which meets on the first Wednesday of each month at 10.15am. Come along for a coffee and some good conversation. A Justice of the Peace is available at the Miramar Library on Saturday mornings from 10.30-11.30am. No appointment is necessary but please contact us on the day to confirm availability. You can ring us on 388 8005.